When a ginormous asteroid is coming straight for Earth and there's only 18 days until all life on our planet ends, what do you do? Well, if you're Michael Bay you hire a team of oil drillers, shoot them into space and get them to drill a relatively small hole in its surface and blow it up, all served with great lashings of cheese. 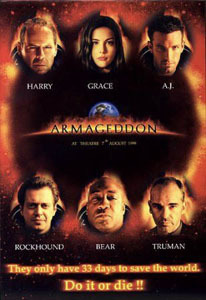 How well do you know... Armageddon?